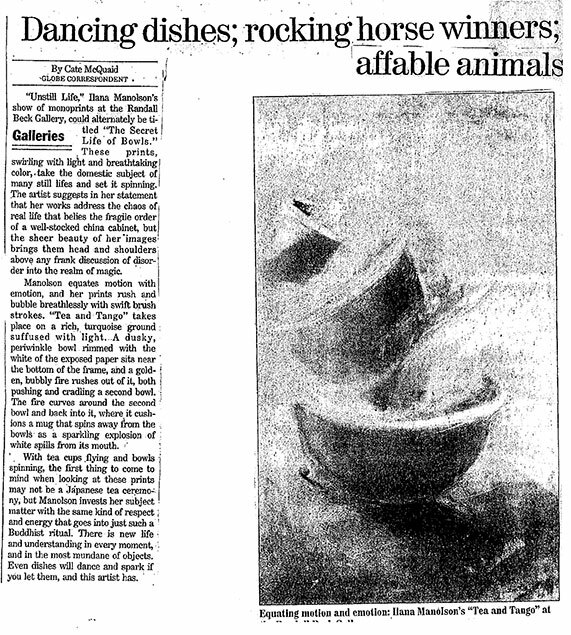 "Unstill Life," Ilana Manolson's show of monoprints at the Randall Beck Gallery, could alternately be titled "The Secret Life of Bowls." These prints, swirling with light and breathtaking color, take the domestic subject of many still lifes and set it spinning. The artist suggests in her statement that her works address the chaos of real life that belies the fragile order of a well-stocked china cabinet, but the sheer beauty of her images brings them head and shoulders above any frank discussion of disorder in the realm of magic. Manolson equates motion with emotion, and her prints rush and bubble breathlessly with swift brush strokes. "Tea and Tango" takes place on a rich turquoise ground suffused with light. A dusky, periwinkle bowl rimmed with the white of the exposed paper sits near the bottom of the frame, and a golden, bubbly fire rushes out of it, both pushing and cradling a second bowl. The fire curves around the second bowl and back into it, where it cushions a mug that spins away from the bowls as a sparkling explosion of white spills from its mouth. With tea cups flying and bowls spinning, the first thing to come to mind when looking at these prints may not be a Japanese tea ceremony, but Manolson invests her subject matter with the same kind of respect and energy that goes into just such a Buddhist ritual. There is new life and understanding in event moment, and in the most mundane of objects. Even dishes will dance and spark you let them, and this artist has.